It is time to face the facts: My Little Pony is a worldwide phenomenon. 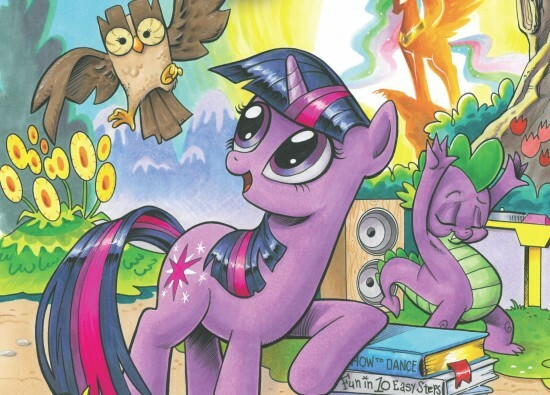 The My Little Pony: Friendship is Magic comic from IDW has now sold over 1 million copies in less than one year. The first issue is also the best-selling comic in IDW’s history. “We have a great relationship with Hasbro, one we’ve always been very proud of, so selling a million copies is a really big deal, but to be able to celebrate the achievement with Hasbro makes it even sweeter, ” said Ted Adams, IDW CEO & Publisher. In celebration of the milestone, Hasbro and IDW are producing a rare variant cover for issue #12 of the comic, which is due out this month. Only 12 copies of the cover will be available to win through contests and charity auctions. For those of you who follow animation, you know the name Genndy Tartakovsky. For those of you who simply like cartoons, you know the work of Genndy Tartakovsky, and everyone knows who Popeye the Sailor Man is. So in the mathematical equations of Hollywood, this is an odds on favorite to be a winner. Tartakovsky has created some of the most renowned cartoons of his generation. From Dexter’s Laboratory, to Powerpuff Girls and Samurai Jack, his distinct style and flair for storytelling have made him a hit with fans. His first attempt at feature animation arrives later this year with Hotel Transylvania, which looks like it might have been saved by his magic talents. Genndy Tartakovsky is attached to develop and direct “Popeye,” Sony Pictures Animation’s 3D take on the familiar sailor man… Avi and Ari Arad will produce under their Arad Productions banner with Sony Pictures Animation. As of November, scribes David Ronn and Jay Scherick were attached to pen the script. The Variety report also reminds us that Tartakovsky is technically still attached to direct a feature Samurai Jack film. Hopefully that project doesn’t get lost under the impending successes he is about to enjoy. Stay tuned to The Flickcast for any further updates. Marvel Animation had been on a hot streak. New animated shows based on the X-Men, Spider-Man and The Avengers were all excellent, with an emphasis on storytelling and quality animation that matched the levels of the DCAU. Alas all good things must come to an end, and for some reason the Disney owned Marvel Animation department is very keen on killing its good things before their time. First it was Wolverine & the X-Men which actually got a second season order before getting canned, then The Spectacular Spider-Man had it’s run cut short to make room for a new, less good series. Now the best Marvel Animated show yet devised , Avengers: Earth’s Mightiest Heroes, is inexplicably ending too. Like Spider-Man before it, EMH is making way for an all new Avengers series called Avengers Assembled. Which based on the early promo images features a team very similar to the mega successful movie. This makes little sense and reeks of a bad move. It would be one thing if Earth’s Mightiest Heroes didn’t feature key elements of the movie-verse, but all of the established heroes all exist in the EMH‘s universe already, and with the rotating nature of the team in season two, it would have been very simple for the show creators to shape the show into the movie’s image. But whats done is done, Earths Mightiest Heroes finishes its second run this year with Avengers Assemble beginning sometime in 2013. Spider-Man cartoons have always been among the very best in Super-Hero animation. Most recently the series Spectacular Spider-Man managed to be the fourth or fifth iteration of the character that actually worked as an animated series. So there is high hopes for the new Ultimate Spider-Man series. In anticipation of the series premiere, Marvel has released a few stills from this upcoming season with certain guest stars cut out. Time to play the guess who’s coming to Ultimate Spider-Man guessing game! These little teases are nothing new in the comic world, with covers often released with cutouts to ramp up anticipation. Doing this for an upcoming animated show, on the other hand, is downright inspired. This is the perfect way to drum up interest in a new series few people even knew was coming. The show will hopefully join The Avengers: Earth’s Mightiest Heroes as the new watermark for Marvel animation. DC has long held the title of best hero cartoons, but now that Marvel has the backing of Disney, there is no reason we can’t see JLU quality programming set in the Marvel universe. You can check out the full set of pictures after the jump, and don’t forget to catch the series premiere this Sunday. Yes, you read that right. Directly from the “please don’t ruin my childhood. . . again” department comes word, via MTV Movies Blog, that director Robert Rodriguez will begin filming a live action adaptation of the classic 60’s Hanna-Barbara cartoon The Jetsons sometime next year. According to Rodriguez, he will be pushing forward on his sequel to 2007’s Grindhouse with Danny Trejo in Machete and he’s also working on the sci-fi thriller Nervrackers for the Weinstein Company set for release next April. No word on where this fits in with Rodriguez’s reboot of the Predator franchise or what this could mean for a sequel to Sin City, but the Texas native says that filming for Jetsons could start as soon as 2010. The director has already stated that he’s dropped a remake of Barbarella due to the amount of time he’d be away from his family, so doing a remake/reboot of the classic 60’s cartoon family from space may just fill that sci-fi void that the scantily clad vixen could have. Given Rodriguez’s track record with both kid-friendly adventures (Spy Kids, The Adventures of Shark Boy and Lava Girl) and adult-friendly horrors (Planet Terror, From Dusk til Dawn), what could this mean for our favorite childhood cartoon? Will his on-again off-again partner and friend Quinten Tarantino come aboard in any way, and will this be under the helm of Rodriguez’s long-term distributors, the Weinsteins? With production starting before 2011, these answers probably aren’t far behind.